Hanami (花見, cherry blossom viewing) provides a poetic allegory for the ephemeral nature of life: from a cold and desolate winter springs forth an abundance of warmth and beauty, only to quickly return into the nothingness from whence it came. 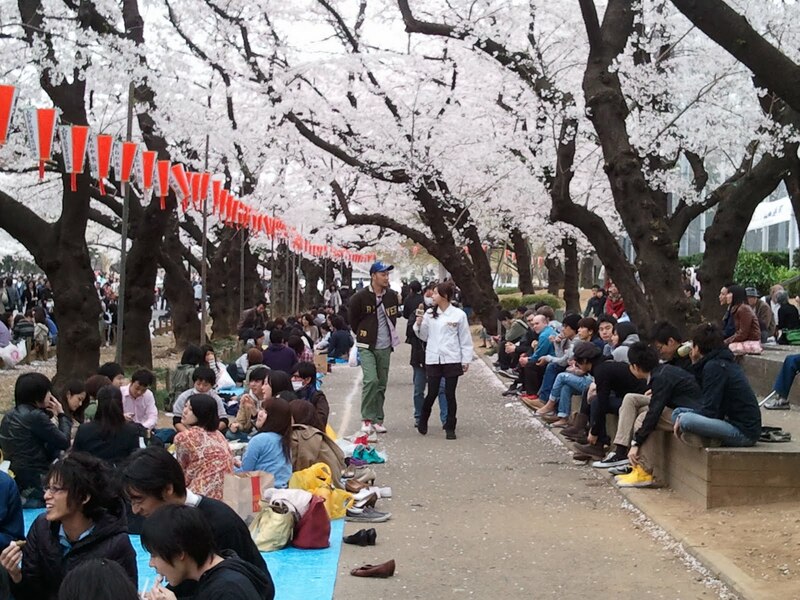 Since times long before our own, hanami parties in Japan have been an opportunity for joyous revelry. Young lovers, elderly couples, emperors, and townsfolk alike would gather together under a ceiling of fragrant pastel to share poems, company, food, and drink. Given the tragedies that have unfolded this year, hanami has taken on a more reserved tone. The Tokyo Metropolitan Government offices have made an official request that the parties be limited in scope. This is of course completely understandable. Nearly 30,000 people having lost their lives and hundreds of thousands of people are now without a home to call their own as a result of the twin disasters of the Touhoku Earthquake and Tsunami (please follow the link below to donate to Japanese relief efforts). However, Touhoku-based sake and beer brewers have pleaded that people still have a drink or two under the cherry blossoms. Purchasing alcohol from Touhoku, while not as direct a method of providing relief to Japan as donating money, certainly provides an economic boost to these devastated communities. Your best options for a Touhoku-based beer are the offerings provided by the Ginga Kougen Beer Company ( www.gingakogenbeer.com/english/index.html) and the Hitachino Nest line of beer made by Kiuchi Brewery (http://www.kodawari.cc/?en_home.html). While the Ginga Kougen is only available in Japan, Hitachino Nest is available at most craft brew stores in the United States. 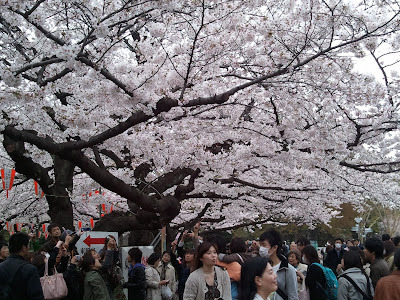 I recently visited Ueno Park in Tokyo in the spirit of supporting Touhoku and doing some hanami of my own. 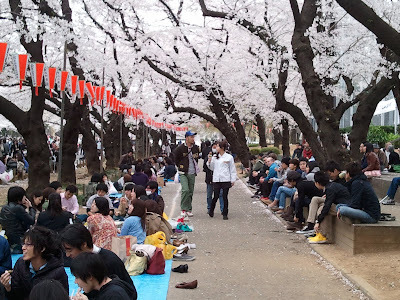 A quick visit to Ueno at the beginning of April certainly confirms its fame as a prime spot for hanami parties as the park is flooded with people sipping suds and eating bento under a sea of fully bloomed cherry blossoms. 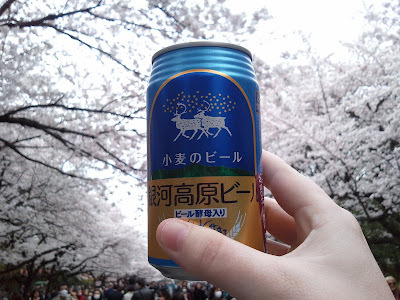 While many of those at Ueno had chosen to drink the ‘sakura seasonal’ Asahi, Kirin, Sapporo, and Suntory, I stayed away. As best as I can tell, these beers are nothing but the normal fare with a cherry-blossom label slapped on in the hopes of making people think something special was waiting to be imbibed just beyond the decorative exterior. Instead, I went with a Ginga Kougen Weizen- both to support Touhoku, and because it’s a damn tasty beer. Ginga Kougen Weizen brew pours a rich, cloudy, golden hue and is topped by a with a frothy cloud-white head. Little to no lacing clings to the glass. The appearance is very true to the style. The aroma of this beer is also very true to the hefeweizen style. Rich and bready smells are present but an acutely powerful clove aroma pierces through. A mild yeast funkiness is also apparent. Taste-wise, this beer is rock solid. As the aroma would indicate, strong banana bread and clove flavors dominate. The clove is just a bit stronger than it should be, but does help cut through the thick malty flavors. The texture of this beer is a bit thicker than many hefeweizens and with a bit less carbonation than usual. All in all, I could drink this beer on a hot summer day or a cold winter night and be satisfied with either. Its light alcohol content (5.0% abv) lends itself to being a session beer, but the complex flavors makes just a pint capable of producing a contemplative experience. Speaking of contemplation, I know it’s been a while since I posted. For once, this is not due to my laziness. Given the nature of the circumstances in Japan over the last month I had decided it would be in bad taste (even worse taste than a Chelada) to post on drinking beer while so many suffered in this nation that has been indescribably gracious to this awkward gaijin. If you can find the time and the money, please donate to Japan relief efforts here: www.directrelief.org. One hundred percent of the money donated goes directly towards aiding relief in Japan. Until next time, weary brewerists.